The Jews, Modern Israel and the New Supercessionism: Resources for Christians has just been reviewed in the Christian newspaper Evangelicals Now. I must confess I wasn't too hopeful about a positive review, given the paper's invitation to Stephen Sizer to review Barry Horner's Future Israel (about this, on his blog Sizer wrote: "O dear. I really don’t want to have to review this unpleasant little book but those nice people at Evangelicals Now have asked me to, so I will, eventually.") Thus, one blogger has questioned the newspaper's editorial policy on issues relating to Israel and Zionism. Yesterday I discussed briefly two books by the same author (Mario Aguilar) which explore liberation theology, my original review of which appeared in the Church Times. In fact, Aguilar went on to produce a third and final volume in the series, which Church Times also asked me to review, together with another title surveying faith in Latin America that included a quite valuable section on Latin American Pentecostalism. My review article is available on the Church Times website. Although I write about Latin American Pentecostalism, from time to time I am sometimes asked about another expression of faith and politics which was important in 1980s Latin America: liberation theology. The big question, of course, is why liberation theology, which promised so much to Latin America's poor, has not met with anywhere near the same amount of success as Pentecostalism, which finds its greatest strength among the very same socio-economic group liberation theology sought to champion. I talk about this at length in the last chapter of my Revolution, Revival, and Religious Conflict in Sandinista Nicaragua and will post something about it here in due course. But in the meantime, for those who are interested in how liberation theology has evolved you might want to read the following review article I did for the Church Times. In short, I argue liberation theology's evolution has made it an essentially academic discipline played out in the university ivory tower, rather at the barrio (or shanty town) level. Thus, it has lost its very central defining feature: praxis. Over the past few days I've posted various book reviews on titles exploring the relationship between the Church and Israel, together with a paper or two on the topic. I thought I'd move on to another issue for the next day or two, but in the meantime, here is my last review (for now) on books exploring this issue. The following book review appeared in Evangelical Review of Society and Politics 2.1 (2008). Israel, God’s Servant, by David W. Torrance and George Taylor. Milton Keynes: Paternoster, 2007. 224pp. pb. £9.99. Review of Gary Burge's "Whose Land? Whose Promise?" The following book review first appeared in Evangelical Review of Society and Politics 1.2 (2007), 62-4. It was later reproduced in Pneuma Review 11.3 (2008), 69-71.
by Gary M. Burge. Cleveland: Pilgrim Press, 2003. The following book review appeared originally in the Bulletin of Latin American Research 28.4 (2009, 561-2) in a special edition exploring the fiftieth anniversary of the Cuban Revolution. Corse, T. (2007) Protestants, Revolution, and the Cuba-US Bond, University of Florida Press (Gainesville, FL), xi + 194 pp. $59.95 hbk. This important study explores a considerably under-researched field in Cuban Studies, namely, Protestant–state relations during the revolutionary period. Drawing on substantial archival material and various interviews with church leaders, Theron Corse focuses especially on how pre-revolutionary Cuban Protestant institutional bonds with their US counterparts have proved durable and resilient since 1959, while the selfidentity implanted by US missionaries has assisted Cuban Protestantism to survive a period of forced autonomy. The Internet can be a wonderful tool. With a little bit of know-how, together with the generosity of some scholars and their desire to see their work distributed to a wider audience once their article or book has run its natural course in the print world, one occasionally comes across full-text access to solid academic resources. A case in point is Power, Politics, and Pentecostals in Latin America, edited by Edward L. Cleary and Hannah W. Stewart-Gambino (originally published by Westview Press in 1997), which is a seminal work exploring the intersection of Pentecostalism and politics in Latin America. The book contains various excellent chapters on different aspects of the social and political impact of Pentecostalism - both explicit and implicit - across that continent, and this book is a vital resource for anyone interested in this field. I am grateful to the authors and publishers for making this title freely available and would encourage all my students exploring this field to engage with this book. The full text of Cleary's and Stewart-Gambino's excellent work is available here in both PDF and html formats. In keeping with the aims of this blog, I'm slowly building up a list of theological resources on this and my mirror site (http://www.calvinsmith.org/) in the fields of Pentecostal Studies, the Church and Israel, and hermeneutics (particularly biblical theology's contribution to it). It will take some time to do this but some resources are already available for browsing at the above site, including book reviews and some journal and conference papers. I'll announce any new resources here as and when they are posted on either site. Hope you find what's already there useful. Public worship takes many forms depending on the church one attends. Styles include ultra-liturgical, traditional, easy listening contemporary, upbeat reworkings of old hymns, and so on. But perhaps the most popular (better, perhaps the most publicised) style is that found in ultra-modern churches that meet in auditoriums often filled with youthful, trendy congregations decked in the latest fashions (with not a tie and collar to be seen), led in worship by a line of similarly-dressed worship leaders and accompanied by a large, professional band playing contemporary music with a soft rock twist. Such churches take their cue from a large church in Australia, which many today seek to emulate (some successfully, others with considerably less skill). Together with the Calvinist-Arminian debacle, eschatology, and more recently responses to modern Israel, pneumatology (theology of the Holy Spirit) arguably represents one of the major fault lines running through Evangelicalism today and which has divided the movement throughout the twentieth century. As usual with these things, views have tended to become sharply polarised, with Pentecostals/Charismatics and cessationists often poles apart. But several years ago a book came out which contained a collection of essays on the topic by scholars and church leaders from a broadly cessationist perspective who sought to provide a fresh, less ideologically-rigid perspective on this issue. The book calls this position "progressive cessationism", and I was asked to review it for Pneuma: The Journal of the Society for Pentecostal Studies (29.1, 2007, 162-3). I think this book is well worth reading, regardless of your pneumatological stance. My review of the book is reproduced here with permission. Review of "Christian Zionism: Road-map to Armageddon?" Here is a review of Stephen Sizer's Christian Zionism: Road-map to Armageddon? (IVP, 2006). This is a more detailed version of my book review, which originally appeared in Pneuma: The Journal of the Society for Pentecostal Studies (2007) and explored the book in light of Pentecostal Studies. An explosion of Evangelicalism (predominantly Pentecostalism) across Latin America during the 1980s quickly captured the attention of sociologists. Since then, this ripe field of research has been extended to include the social and political impact of explosive Pentecostal growth in Africa and elsewhere, while the entire phenomenon has arguably spawned a relatively new, interdisciplinary academic field, Pentecostal Studies, which is now well-established in respected universities and centres throughout Europe and North America. When I first launched this blog I discussed briefly the rise of Pentecostal Studies as an academic sub-discipline of theology. To a large part this is owed to the explosion of Pentecostalism across Latin America in the 1970s and especially the 1980s, which attracted the attention of sociologists, historians, political scientists and others keen to explore the extent to which this phenomenon has had on society and politics across that continent. Since the 1980s there have been numerous studies and book exploring this topic. This is an area which I write about from time to time and I am sometimes asked to review books on the subject. Where possible I plan to post those reviews here. The following book review was originally published in Pneuma: The Journal of the Society for Pentecostal Studies 28.2 (2006), 374-6 (reproduced with permission). In mid-2005 I completed my Ph.D. at the University of Birmingham, England, on the dynamics of Protestant-state relations in revolutionary Nicaragua (1979-1990). Some eighteen months or so later a version of my thesis was published by Brill (Leiden and Boston), leading a few months later to a kind invitation by the anthropologist Henri Gooren (now at Oakland University, Michigan) and the IIMO Centre at Utrecht University, The Netherlands, to be the keynote speaker for their Religion and Politics in Nicaragua Seminar.The paper I delivered was a brief synopsis of my research and first book. This paper is now available on the King's Evangelical Divinity School website. Here is the second of two promised reviews of books exploring biblical theology (this review also originally appeared in Evangelical Quarterly - 80.1, 2008, 74-6). In my last post I briefly discussed biblical theology and promised to post several book reviews on the subject. The first (below) was originaly published in Evangelical Quarterly (78.3, July 2006, 274-6) and concerns an excellent book on the issue and how it relates to hermeneutics. Not for the faint-hearted, this collection of essays offers a theoretical rather than methodological treatment of where biblical theology and hermeneutics intersect. It also explains how postmodernism (ironically) paves the way for a return of the discipline within academic theology. More on this in my book review below. I launched this blog by outlining two areas of academic research I focus upon and write about: 1) the Church and Israel, and 2) Pentecostal Studies, particularly Pentecostalism in Latin America as well as Pentecostals and politics generally. Howevert, in addition I have several other areas which I teach, notably hermeneutics (biblical interpretation) and especially how biblical theology aids our understanding and interpretation of the Bible. Biblical theology is the discipline which focuses on the entire Bible narrative (or metanarrative, sometimes also referred to as the canonical narrative) and how every genre, form, text, Bible book, and so on, should be interpreted in light of this bigger picture. Having been brought up in a strongly Evangelical household (several family members were in ministry) with an emphasis on the Bible as the divinely inspired and revealed word of God, any approach which focuses on the Bible as a unified whole with a central purpose and narrative was always bound to fascinate and draw me. That biblical theology is now in the ascendancy within academic theology (a development, ironically, arising out of a postmodernist worldview - more on this in the next post) makes this discipline all the more exciting. I developed King's Evangelical Divinity School's biblical theology module for the final year of the Bachelor of Theology programme, and I've also reviewed several books on the subject for the scholarly journal Evangelical Quarterly. I'm explaining this because, from time to time, I plan to post articles here on biblical theology and to comment generally on passages from a biblical theology angle because I believe it is such an essential, key tool for the biblical interpreter. In my next post I'll include a couple of my Evangelical Quarterly book reviews in this field, which I hope you find useful. In the meantime, visit the website Beginning With Moses (see links, left) which I hope you find useful. Moreover, if you delve further into biblical theology as a hermeneutical tool, aim to consider its value in preaching, which goes to the very heart of the role and purpose of biblical hermeneutics. After all, biblical interpretation should have an outworking which makes us all better Christians. Indeed this is the very basis of biblically-based proclamation. Hermeneutics is not an end in itself, but rather a means to an end: the proclamation of the entire word of God so that it may be acted upon and shape us as Christians. In this respect, biblical theology plays an integral role in this bringing about hermeneutics's goal, but only really through a symbiosis of biblical theology and preaching. I've just learned my review of a book for the Bulletin of Latin American Research has been published in a special edition of the journal marking fifty years of the Cuban revolution. The book, by Theron Corse, is entitled Protestants, Revolution, and the US-Cuba Bond (if you're in this item, be sure to hunt around as it available across the 'net for a range of prices). Obviously with the review having just been published I can't post it here yet, but in a nutshell Corse focuses on how Cuba-US Protestant bonds have remained durable and resilient since the 1959 revolution, while the identity implanted by US missionaries helped Cuban Protestantism to survive a period of forced autonomy. While in Israel during my last visit I picked up an interesting-looking book from Steimatzky’s Bookshop on Ben Yehuda Street, entitled Zion Before Zionism, 1838-1880. It was written by Arnold Blumberg, professor of History at Townson University for forty years and a noted historian scholar who wrote seven monographs and various journal articles. I was attracted to the book because, together with early Zionist and Israeli history, the pre-Zionist period of Palestine intrigues me. We hear so much false history invoked in the current conflict, that is, false statements that have entered the current debate as “fact”. This is because history is such a powerful weapon in any political and military conflict, and especially where nationalism and nationalist sentiments are involved. For this reason I am always interested in studying the underlying historical facts associated with Zionism and Palestinia nationalism to determine accuracy and dispel myths. On 11 September I explained how there were two academic areas in particular I research and write about. The first was Pentecostal Studies, which I discussed in that post. The second is Christian responses to the modern State of Israel. This is a broad area, encompassing biblical studies, theology, Middle East history and politics, ethics, and so on. Like the world, the Church is bitterly divided over this issue, with opinion sharply polarised and little focus on the middle ground. Over forthcoming months I will post some comments on this issue, exploring the topic from various angles and trying to engage more with the middle ground. 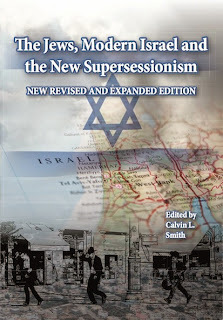 In the meantime, consider my The Jews, Modern Israel and the New Supercessionism: Resources for Christians (to buy click on the book icon, right), which contains a collection of essays from various contributors exploring the issue from different angles and disciplines. Society for Pentecostal Studies. Publishes the academic journal Pneuma. Journal of Pentecostal Theology (academic journal published by Sage). GloPent: European Research Network on Global Pentecostalism. Plenty of resources. Allan Anderson's homepage (University of Birmingham, England). Lots of conference papers, articles etc. Aside from bread-and-butter teaching areas and interests, there are two academic foci I research and write about, the first of these being Pentecostal Studies. This is a fascinating area, though sometimes misunderstood by Evangelicals who personally might lean away from a non-Charismatic theology or experience. Technically, Pentecostal Studies is an academic discipline, that is, a sub-branch of theology which explores the history, theology and practice of the movement, regardless of whether this is done from an internal-participant or external-observer perspective. Thus, one does not necessarily have to be Pentecostal or Charismatic to specialise in Pentecostal Studies, while many specialists in the field keen to determine its social and political impact explore the movement strictly as a social phenomenon. Indeed, some students of Pentecostalism are agnostics or even atheists. Welcome to my new blog. Actually, I've been blogging for a while (though admittedly the posts have been somewhat erratic of late) over at the blog for King's Evangelical Divinity School, where I lecture. I will, of course, continue to contribute to the KEDS blog, but because I'm involved in several projects and have a variety of research and other interests I decided to launch my own personal blog. Nonetheless, any new KEDS posts I produce will also appear here, together with feeds to my earlier posts on that site. But do please continue to visit the KEDS blog, which features many excellent posts from my illustrious KEDS colleagues. In the meantime, I look forward to blogging on both sites!